Johnson Family Dental is hosting their 17th FREE Dental Day at their Solvang office on Saturday, May 11th from 8am-1pm. Over 100 members of the community are expected to turn out for the event that is held at the Johnson Family Dental office at 678 Alamo Pintado Rd in Solvang. 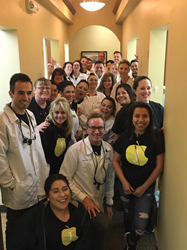 Members who can’t be seen at the FREE dental day event on May 11th have the opportunity to attend Johnson Family Dental’s alternate free dental day at our office located at 3906 State Street in Santa Barbara. The Santa Barbara office will be having their FREE Dental Day on Saturday May 4th from 8am-1pm. Johnson Family Dental is a rapidly growing group dental practice based in Santa Barbara, California. Since 1963, Johnson Family Dental has been delivering quality care to Central California residents. With five convenient locations, Johnson Family Dental provides comprehensive general, specialty and orthodontic care in Santa Barbara, Ventura, Solvang, Camarillo and Port Hueneme. Driven by their belief that “a smile can change your life”, the Johnson Family Dental team is committed to delivering gentle and compassionate care at an excellent value. Johnson Family Dental relies on Smile Brands to provide world-class business support services so they can focus on delivering highly personalized patient care. Learn more at johnsonfamilydental.com.